Cape Breton, N.S. 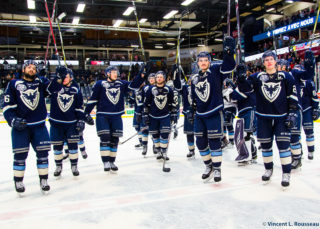 – A few days following a weekend that saw a pair of Sherbrooke victories, the Phoenix boarded the team bus for a road trip to the east coast. Last time they were in the Maritimes, they collected three wins in three nights. This time however, they face much tougher competition, up against three of the league’s top seven teams. They got their first taste of the talent on Wednesday, falling 5-1 to the Cape Breton Screaming Eagles. Chances are, after sitting in a bus for over 13 hours it would take some time to get the engine going again. And, it did. The Screaming Eagles soared high over the Phoenix all night long, leaving no doubt in the result of this contest. It started with the CBSE’s leading scorer, Mitchell Balmas, scoring a pair of goals 1:56 apart from each other to give his team an early two-goal cushion, while reaching the 30-goal plateau at the same time. His first came off a Phoenix turnover in the defensive end, then soon after, he found a lane through the traffic in front to double the Eagles’ advantage. 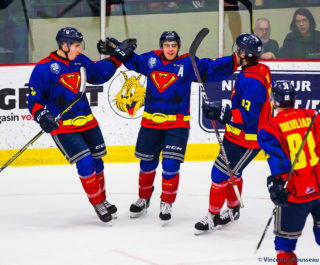 Antoine Crête-Belzile, older brother of Phoenix defenseman Olivier, registered an assist on Balmas’ second goal in the siblings’ first matchup of the season. Period two once again favoured Cape Breton, as they added to their lead on multiple occasions. Egor Sokolov hopped onto the ice and almost immediately received a pass before wiring a shot short side past a stunned Thommy Monette bringing the crowd of 2038 to a rise. At 13:56, Brooklyn Kalmikov got his name on the scoresheet, tucking home a rebound, to weaken the Phoenix’s hopes of a comeback. The final frame was dominated by discipline, as the teams combined for 24 penalty minutes. It began just 0:57 into the period, when Nathan Larose was given a double minor for high sticking. On the ensuing power play, Patrick Guay beat Kevin Mandolese from the high slot, giving the rookie his 14th of the season. 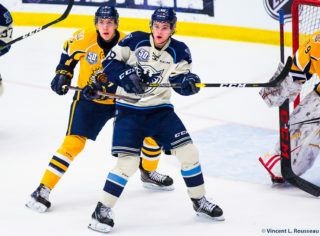 Samuel Poulin’s assist on the goal concluded a stellar January, where the 17-year-old tallied 15 points in 11 games. That would be the Birds only goal of the night, in a game where they went 1/6 on the man advantage, while only managing 24 total shots on goal. Mitchell Balmas completed his hat-trick about midway through the frame, hammering one through Monette from the faceoff circle, to put his team up 5-1 and close the curtains on the contest. Sherbrooke narrowly outshot Cape Breton 25-24. 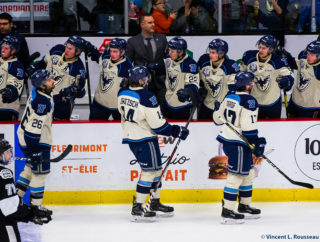 The Phoenix kick off a back-to-back on Friday night versus the Halifax Mooseheads, before heading to Charlottetown on Saturday to play the Islanders.